Introduction: Evidence suggests that poor information transfer and communication practices are a leading cause of medical errors and adverse events. Despite this, little is known about what these communication failures are, why they occur and how to prevent them. We conducted an interview study to identify information transfer and communication problems across the entire surgical care pathway. Methods: Semi-structured interviews were conducted with a purposive sample of 18 Operating Room staff (Surgeons, Anaesthetists, Nurses). 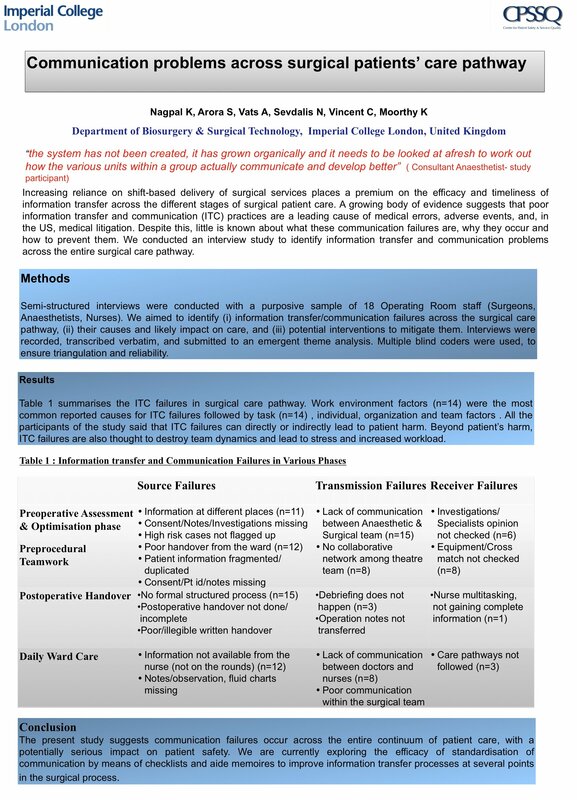 We aimed to identify (i) information transfer/communication failures across the surgical care pathway, (ii) Causes and their impact and (iii) potential interventions to mitigate them. Interviews were recorded, transcribed verbatim, and submitted to emergent theme analysis. Multiple blind coders were used, to ensure triangulation and reliability. Results: (i) Failures: Pre-operatively, lack of communication between Anaesthetists and Surgeons was the most common problem (13/18 participants). Incomplete handover from the ward to theatre and changes to the operating list (15/18 participants) were other problems identified. (ii) Causes and impact: Work environment, lack of protocols and primitive forms of information transfer were reported as the most common cause. All participants (18/18) acknowledged that information transfer failures can cause patient harm including mortality. (iii) Interventions: Checklists and electronic information systems were proposed as potential interventions. Conclusions: The present study suggests communication failures occur across patient continuum of care. All of them have potentially serious impact on the safety of patient care. We are currently exploring the efficacy of checklists to improve information transfer processes across surgical care.